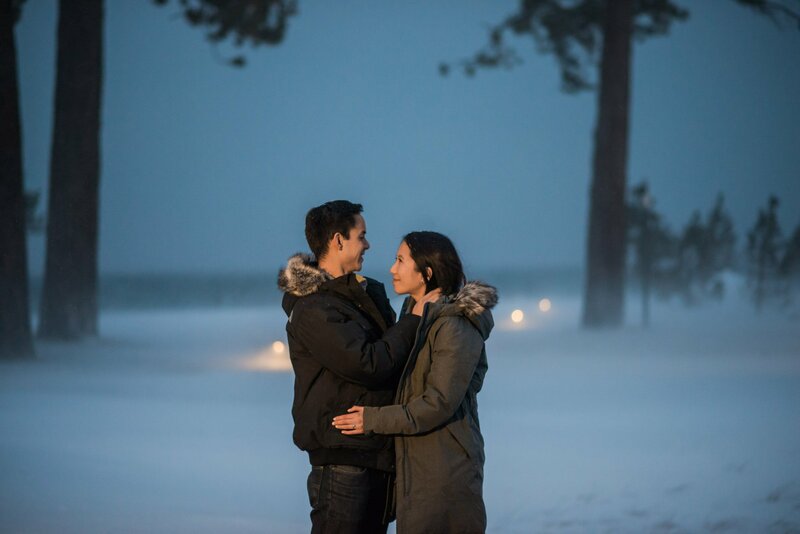 Alex and I had been in touch for over a month in planning his Lake Tahoe Winter Proposal to his sweet girlfriend Kelly. Coming in from New York he was depending on us for our guidance and suggestions.We had originally planned and hoped for a lakeside proposal.The weather leading up to the proposal had been clear and we were even beginning to see showings of an early spring. Clearly we were very excited that the weather was cooperating. Winter however had another idea in store. Literally as soon as March 1st was here, winter came back with a vengeance. So much so that on the day of the proposal, winter blizzard warnings were in full effect. 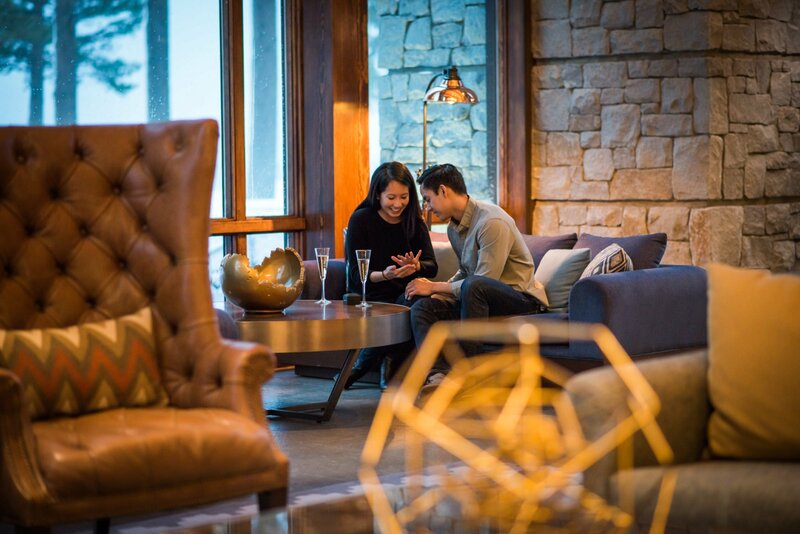 Per our conversations, thankfully Alex had planned a just in case scenario and rented out a private dining room in the newly built Edgewood Lodge. As a result, we had to scrap the lakeside proposal idea and opt for an indoor proposal instead. 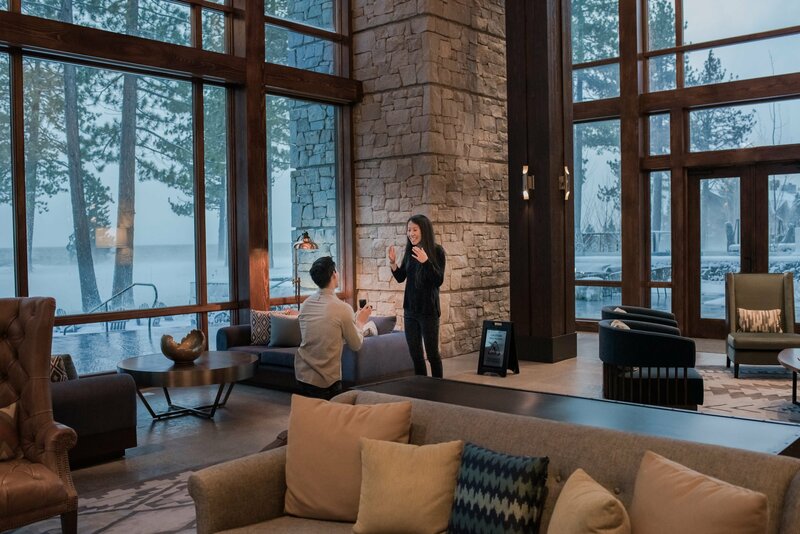 While not quite lakeside, the beautiful lodge with floor to ceiling windows made for the perfect backdrop for a Lake Tahoe Winter Proposal. Even though it normally only takes us 20 minutes, we headed over in our truck in 4wd to Edgewood to make sure we made it in time and strategically placed ourselves in inconspicuous locations to capture the proposal as it unfolded. Alex was able to pull it off without a hitch and Kelly had no idea. Needless to say, she was so surprised!! After giving them a little time to soak it all in, we explored the grounds to capture some more images to help commemorate their happy moment. Furthermore we thought it was really sweet and thoughtful that Alex had planned this as a friends trip to help conceal the real reason for coming to Tahoe. Not only did they help him plan the proposal so that Kelly had no idea. 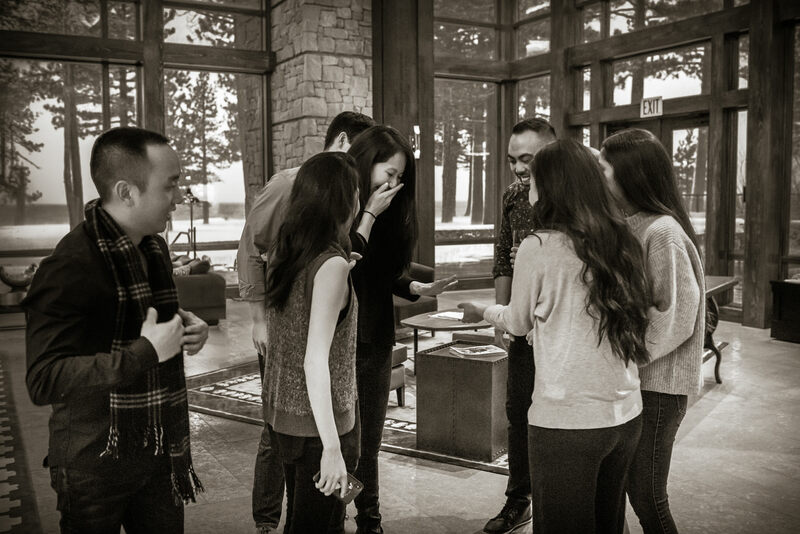 They were also on hand to witness their sweet Lake Tahoe Winter Proposal unfold and to help celebrate. Even though the temps were freezing, we were even able to sneak outside for a few quick and very cold photos of the happy couple. To see more of our proposal work, please check out our gallery.